In this post we give you a quick view of our considered opinion on what our potential customers will experience in 2018. It’s really not as bad as some have made it sound. Beginning in 2018, imported solar panels (modules) will be subjected to an increased tariff for a period of 4 years. As of April 2018, there has been talk of creating some exemptions, however none have yet been granted. The proclamation includes a mid-program review. At first glance, 30% is an alarming number for 2018. However, two circumstances lead us to conclude the negative cost impact is much smaller than many may think. Over the past few years, material costs have been fast declining. In general, solar panels themselves now make up as little as a fifth of the total cost of a typical rooftop residential solar energy project. The highest performance, advanced panels can be as high as a third of the total costs. In the most extreme case the 30% tariff on a premium system, where panels are nearly 33% percent of all costs, results in less than a 7% total hardware cost increase. Some clean energy researchers peg the average residential solar energy system increase at a lower 4%. They increased inventories in advance. Most looked for incremental savings opportunities and efficiencies throughout the supply chain. In some cases companies are accelerating cost saving programs already planned. The net cost impact of the solar tariffs will be low enough that it will not noticeably change the savings and return on investment for most rooftop solar energy systems. As of the end of March, 2018, there was a 25% tariff applied to steel imports and a 10% tariff applied to aluminum. For roof mounted solar, the aluminum tariff will have more impact. For alternative solar configurations, like ground-mounted systems and solar trackers, the steel tariff adds extra burdens. Both of these materials are used in many of the components from solar panels, to inverters and their housings, to the fasteners needed. The overall impact on rooftop and residential solar is expected to be small similar, as well. This supply chain has also followed countermeasures to partially offset the impact of the tariffs. 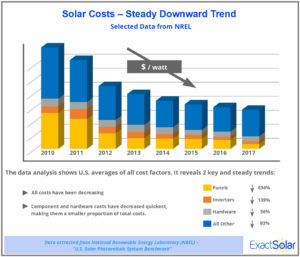 When taken in total, the SEIA (Solar Energy Industry Association) has made a preliminary prediction that the net metals tariff impact will be worst for utility scale solar because of increased steel costs. The organization projects an addition of $0.02 per watt for installations, which is approximately less that 1% of total costs. Any price increase is unwanted. However, at Exact Solar so far we are convinced solar tariffs and tariffs on metals will have a marginal impact on your savings opportunity and the time to return your investment. We have a wide range of high quality solar panel models and other components we choose from. When adding our acute attention to all cost factors under our control, we are convinced that solarizing your home in Pennsylvania and New Jersey will be just as irresistible in 2018 and beyond. We encourage you to Contact Us using the form to the right and get your own personal costs estimate. Find out how a solar energy system in 2018 is still one of the best investments you can can make for your home.